This 10-minute recipe is sure to be a family favourite. 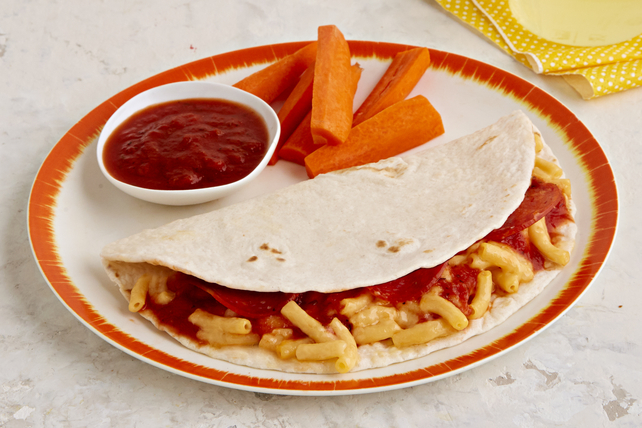 It combines KRAFT DINNER, pizza sauce and pepperoni in a quick tortilla wrap - yum! Prepare Kraft Dinner Cup as directed on package. Place 1 tortilla on microwaveable plate; top with 1/3 each of the Kraft Dinner, pizza sauce and pepperoni. Fold in half. Microwave on HIGH 30 to 45 sec. or until heated through. Repeat with remaining ingredients to make 2 additional quesadillas. Assemble quesadillas as directed. Cook in large nonstick skillet on medium-high heat 3 min. on each side or until lightly browned on both sides. Substitute 3 Tbsp. Kraft Shredded Pizza Mozzarella Cheese for the pepperoni.